I can’t or maybe shouldn’t talk about it yet, but my work situation will be changing considerably in a couple of weeks. Papers are signed and hearts are broken, but I don’t want to jinx things too much. (You know, like having a background check service find out my secondhand connection to the Taliban.) More details when they are available. Does Circle K even exist anymore? I don’t remember ever seeing one until I moved to Seattle, and there was a single one over on Eastlake somewhere. I don’t think I ever went – it wasn’t close to anything I frequented, and I was more of a 7-Eleven guy. My writing ritual while working on Rumored in 1998 was to pass out after work, wake up after a few hours, get something to eat, and then get to the keyboard at 9:00 sharp, with the 6+1 Kenwood CD changer locked and loaded and the day’s notes scribbled on yellow legal pads on my tiny kitchen table repurposed as workstation. At midnight, I’d stop writing, fire up the VW, and go out to the 7-Eleven for a Coke slurpee and a break. Then I’d either go back to work and fiddle around with the book a bit, or watch Conan. The above picture of a Circle K is from Treasure Island, Florida. It was next to the hotel where I stayed in 2001, which meant I’d wander over there for some ice cream or a case of Mello Yello or some chips. I think I was still working on Rumored then, but I got no real work done on that trip. I did a lot of reading, and had many late night phone conversations with someone back in New York. (Of course the only time I really hit it off with someone cool all year is the night before I leave for two weeks.) 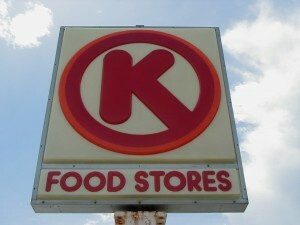 But Circle K seemed to be a very Floridian concept, like Pak-n-save and Waffle House. You know what, I just looked at a map and realized not only is there a Circle K very close to my house, but I’ve been there at least once for gas. It’s one of those weird co-branded things where it’s a 76 station, but the mini mart is a Circle K.
I’ve had a minor cold all week and it’s just about clearing up, but the sky matches the feeling in my sinuses, which isn’t good. Sarah has been gone for work for a couple of days, which means the little cat is all stressed out, which is both cute and sad. The big cat has learned a new trick to distract me while I’m writing: she will climb up onto the entertainment center and use her paw or nose to turn on the PlayStation 3 and eject the disk. Someday I will catch it on camera and it will become a youtube phenomenon. Or not. I’m officially late. I must now go do battle with I-880. The one hint I can give for you is that I won’t be doing this for much longer.